What problems can we encounter when transferring music from Samsung to iPhone, and vice versa? Some of the more commonly known include the following: User experiencing problems with backing up the files prior to the transfer process; Some of the files not transferring so the backup process will need to be used to complete the transfer of all of the files; Files corrupted so that they cannot be accessed on the new device. To help you solve the problems above, we recommend the very program to you today is the Coolmuster Mobile Transfer. 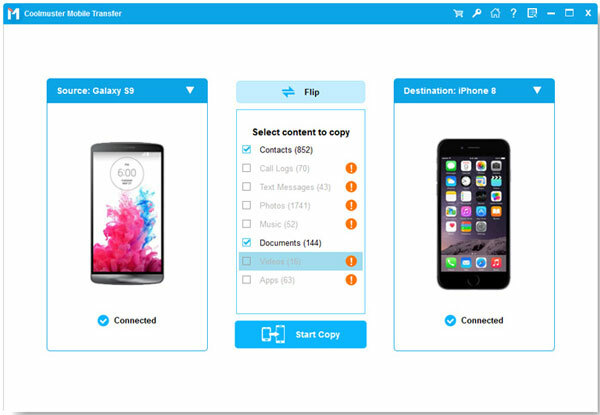 As its name implies, Mobile Transfer can help you transfer your data, including contacts, messages, music songs, photos, videos, apps, and etc. smoothly and easily, no matter you use which phone brand, Samsung Galaxy S7/S6/S6 edge, Galaxy A9/A7/A5, iPhone 7/6S/6S Plus/6/6 Plus, etc. Sounds great, isn't it? 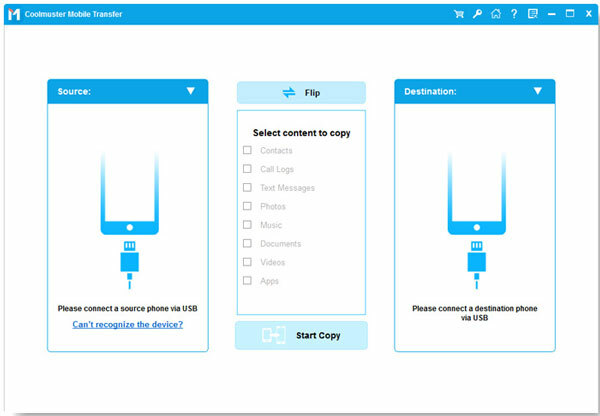 Download Mobile Transfer on your computer and read carefully what the tutorial below tells you to. I beleve after reading this article, transferring music between Samsung and iPhone can be a piece of cake for you. How to Copy Music between Samsung and iPhone? After downloading and installing Mobile Transfer, the interface of the program will be shown as below. Choose the first "Phone to Phone Transfer" section to enter the phone to phone transferring window. Connect both of the phones to the computer via USB cables and the software will detect the two devices and show them in the program window. All transferable file types are listed on the above. Open the file category of "Music" and preview all the music and songs contained in your phones. Tick the ones you want to transfer and give a click on the left or right arrow to start the music transfer.